I Know all of you must be thinking why do we need to see the picture of boiling milk. I really wanted to share this tip with all of you because it really works.Few months back i read it in some magazine that when you boil the milk put a wooden spoon on top of the pot and when the milk is boiling it won't fall off. So last month, while making pudding I decided to give it a test, and as u can see in the picture it really works and did saved my day, but I never got a chance to post this. I took the picture approximately after 50 seconds of boiling process and I believe any body who has ever boiled milk knows what a mess it is when milk over boils & it's all over the stove top. He : this milk has a smell. She : really ????? I opened the milk jug just two days back only. He : r u sure? She : yes.....DD just had it...didn't complained. He : no words spoken...trying to finish his breakfast. Back to the morning......now I'm thinking what to do with this milk.....should I make a curd(home made yogurt), NO that's not a good idea......O.k decided paneer(Indian cheese) is the right option. Put the milk to boil, and went on with other things....kept checking it in between, milk is almost done may be another 3-4 minutes, turned the stove to low put the wooden spoon on top.......went outside the kitchen for a minute to see little one........now, little one saw mommy & wants mommy.........so, mommy picks the little one and forgets all about the milk and spends good 20 min. or so to help little one sleep.......came back to the living room & wondering why I left the kitchen light on....OMG, it's the milk....ran to the kitchen & saw that my wooden spoon has saved my day, thank God. Quickly took the action & tadhaa....paneer(Indian cheese) is ready, I strained it directly in my steel strainer & left it on top of the pot to get all the water strained out........and thinking, wow, I saved the money going down the drain(get it, instead of throwing the spoiled milk i turned it into cheese...isn't it great). Fast forward 2 hours, time to fix the lunch......saw that cheese, looks like still have some water in it as I didn't put any weight on it. Took that same wooden spoon, you all know that they have round handles and not flat kind, using my thumb on the handle try to squeeze some water out of the cheese and uh....oh....Fate could not be escaped. Thumb slipped, lost control of my hands & cheese is all over the kitchen. Little one came running to the kitchen, saw the mess & gave me a big smile as if saying Thanks mommy for setting up a big mess & eating from the kitchen floor game......let's start playing now.........and yes, did I said, I still saved some cheese around quarter of a cup. Photo courtesy : Food Blogging. As now a days whenever possible I take click if food is involved in any way. This incidence happened few days back and same day I got message from Dear Malar that she's hosting Kitchen Mishaps event, so I guess this is my perfect mishap for her event, with the hope that I don't have to send you more entries, here it goes to you Malar. So you had quite an exciting time !!!' Jokes apart, very well written indeed. And again thats a very useful tip for everyone'...I have spoiled milk several times. Even thought...milk will only boil during the moment I turn a bit!!! 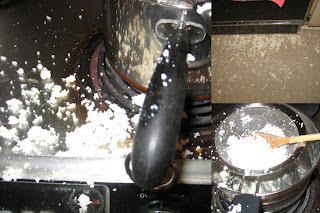 Lovely post; nowI have to find the perfect recipe to boil some milk; love to learn new tips. Funny! I am relieved to see that those things are common to all of us! I would have dumped the milk however and thought of other things to do instead! Yes these kind of things do happen in every kitchen. But loved the way you wrote the whole thing.